When I had learned about Greyhound Blood donors being at Animal medical Center and ultimately corresponded with Dr. Ann Hoenhaus, much to my surprise, they offered to give me a tour of their facility. It has come to our attention that Animal Medical Center houses and uses greyhounds as blood donors. Our program is very concerned about the on-going welfare of greyhounds that are held at medical facilities and would hope that the canines held at your facility are being adequately and humanely cared for. If possible we would like to inspect the facility to get a good sense of how the greyhounds are being cared for. I know Animal Medical Center has a wonderful reputation and I would hope the care of its greyhounds will reflect that. Please contact our office so we can possibly arrange an inspection. We appreciate your cooperation. In response to your letter, we welcome a visit to view our facility. I have been in charge of the Jaqua Transfusion Medicine Service since 1988 and I would like to take this opportunity to describe our blood donor program as we are very proud of our long involvement with greyhound rescue and the lives we have been able to save by providing transfusions to hundreds of dogs over the past 25 years. While at AMC, the greyhounds reside in a kennel ward which was designed specifically for the greyhounds and houses only the donors in order to isolate them from hospital patients with infectious diseases. The greyhounds spend approximately 25%of their time at an indoor/outdoor kennel in New Jersey where they become accustomed to interactions with other dogs and cats. The primary caretaker of the greyhounds is an employee assigned fulltime to the care, feeding and socialization of the greyhounds and she has been in this position for over 15 years. She bonds with each dog and is an integral part of the final adoptive guardian choice when a dog is retired. The licensed veterinary technicians assigned to the donor program as well as members of the patient service department provide additional care. To ensure the health of the greyhounds, they receive routine preventative health care such as annual physical examinations and screening blood tests, heartworm and flea prophylaxis monthly, and dental cleaning as indicated. Our greyhounds donate blood for transfusion no more often than one unit of blood every 4 weeks which is less frequent than the published maximum recommendation of once every 3 weeks. I would like our key donor program personnel to be available for your visit so please call my assistant, Denise Wishengrad at 212 329-8609 to arrange a convenient date and time. Thank you so much for your timely response to my letter. I would like to make arrangements in the near future to visit your facility. I certainly appreciate your extended offer. I will contact Denise shortly to arrange that visit. Below is a review of conditions of greyhound blood donors held at AMC done by David G. Wolf, Director, National Greyhound Adoption Program. Several weeks ago I learned for the first time that the Animal Medical Center in New York has greyhounds as blood donors. At the time that's all the information I had and didn't know how many dogs they had or how they were being kept. In an effort to determine if in my view their care was appropriate, I sent a letter to them and much to my surprise received a very fast response from Ann E. Hohenhaus D.V.M. Dr. Hohenhaus approved my visit to their facility and on Wednesday, April 14, 2004 I visited the Animal Medical Center. It was originally founded in 1910 and is an 8-story facility that literally does everything. Upon my arrival I began on the eighth floor and worked our way down. This is a facility that does all its lab work in-house such as biopsies and necropsy (autopsy), and we had a look at the MRI equipment. They provide many services and seminars for people to come in. These seminars are attended by local people, people across the nation and sometimes from other parts of the world. They have a staff of 200 veterinarians as well as support staff of technicians and all other people needed to take care of such a facility. As I walked through the building I was very impressed. They take special care of high profile clients, and while I was there President Nixon's daughter was waiting for her dog (non-greyhound) to be attended to. They are a non-profit organization that is 501 C 3 a federal designation for non-profits. They have a huge budget. I believe they are very proud of what they do, that was evident from the public relations person Denise Wishengrad who guided me through the building. Considering they have 14 greyhounds I was surprised their library didn't have 'Care of the Racing Greyhound', the bible when it comes to greyhound health issues. Dr. Hohenhaus indicated in her letter to me, and I quote: 'to ensure health, greyhounds receive routine health care, annual physical examinations, screening blood tests, heartworm and flea prophylaxis and dental cleaning as indicated. Our greyhounds donate no more than one unit of blood every four weeks.' I was totally impressed with their operation up to that point. When we got to the greyhound ward, and I say that because it looked like a hospital ward, there were approximately 15-18 stainless steel enclosures. The separations between the cages did not permit one dog to see another dog. Everything was connected by narrow aisle ways from one area to another. We were greeted by one of the donor greyhounds that was walking around one of these narrow aisle ways. We were told each of the greyhounds during the course of the day would have the opportunity to do that; this is their exercise, and their only exercise. At even the worst tracks dogs are let outside 3-4 times daily. After my trip I spoke with a contact at the ASPCA in New York, they were under the impression that the greyhounds exercised on the roof. I was not given that information, they were quite clear the greyhounds did not go outside while in New York. The greyhound that greeted us was about 12-15 pounds overweight. He was happy to see us. I think they were somewhat surprised when the first thing I did was open his mouth and look at his teeth, they needed to be cleaned. I then proceeded to inspect several other greyhounds. Some had nails that were too long but universally all needed varying degrees of dentistry. Some had minor dental issues and others had advanced periodontal disease, obvious root exposure, and one had bloody raw inflamed gums in need of extractions. I did not look at every greyhound's mouth. As I was looking at the dogs the staff told me the dogs have routine teeth cleaning. Their remarks were questionable. Certainly the dog with the extensive plaque and tartar and bloody red gum linings had not been looked at or addressed in a very long time. Some dogs were happy to see us, but others were spooks. A spook is a very, very shy dog. They tried to down play this fact but they were spooks. Looking into one of the cages in the far right hand corner was a bed raised approximately 8' off the floor and was approximately 30' wide x 36' long with a canvas cover. In my view it was much too small and certainly too uncomfortable for most greyhounds of appropriate weight. Some greyhounds that are fat would probably be less uncomfortable than those of normal weight. I considered the bedding to be totally inadequate. The area to the left of the bed was very narrow, there was hardly enough room to turn around, if they would turn the bed around the dog would have additional room. It was about 16'-20' wide and in front was an open area the width of the cage about 24'-28' deep. In my view the cage size was totally inappropriate. The water bowls were too big; they were round not flat-sided, which reduces movement room inside the cage, they were attached to the front door of the cage. The food dishes were the same. At our kennel we use flat-sided bowls that hook on as opposed to the kind that have handles. None of the dogs had collars on. It is my perception that if they were wearing collars they would have been at risk of getting caught on their food bowls. When I spoke to Denise about different types of bedding I was told that the dogs tear up fleece and any other kind of bedding put in their cages. At our kennel, which keeps 60-100 greyhounds at a time, only a small percentage will do that. Our dogs sleep on carpet with their own blanket and if their bedding becomes soiled we will change and wash it. It was their belief that blankets washed in a machine would transmit bacteria. Give me a break. Our greyhounds get outside 4 times daily to relieve themselves. I believe those blood donors are never outside and are certainly forced to relieve themselves inside their cages, which would then be hosed down. This may be why they don't use bedding. I reflect back on the dogs that come to us from Florida and other places, that are possibly in a truck for 16-20 hours and try so hard not to mess in their cages. When they arrive and are off-loaded they seem to urinate forever. Greyhounds that come to us from racing are let out 3-4 times per day for air, exercise, and to relieve themselves. I believe it to be degrading to be continually subjected to a prison where you must adapt to urination and defecation within the confines of where you sleep. While I was riding back to Philadelphia on the train I asked myself why such a high percentage of greyhounds would tear up their bedding. I have to assume that they were bored stiff. I realized they had few toys, they had no chew bones, they had no distractions, and most of all they get no exercise. I was told they go on a rotation basis to a farm/kennel owned by one of the staff members. Later I chatted with that member who breeds AKC Irish Setters and Irish Wolfhounds for show. Her dogs are housed at her kennel in the same fashion as the visiting greyhounds. It sounded like the cages were somewhat larger, possibly 5'x 6' or 6'x 8' indoor/outdoor cages. Whatever the size was indoors was the size outdoors. They call the outdoor section a run, so their runs were approximately 5'x 6' wide or 6'x 8' wide. No dog can run in an area that size. Our runs are 15' wide x 150' long, our exercise areas vary with an area of 40'x 40' being the smallest. I was told that all of the dogs would ultimately be adopted. Nothing I saw made their stay conducive to being adopted. Nothing was being done to deal with the shy dogs and everyone looked at me cross-eyed when I mentioned that thyroid supplementation makes spooks come out of their shell. These dogs are prisoners. Animal Medical Center gave the impression they had to keep this very controlled atmosphere to reduce bacteria. I believe it is baloney. The University of Pennsylvania Veterinary School uses a blood-mobile to collect blood from pets not greyhound. Not exactly a controlled atmosphere. I believe that they believe they are doing a good job caring for these greyhounds. In my eyes they fail miserably. I was told that on 2 specific occasions one of the greyhound blood donors had come in with a broken leg and they had spent the money to fix it; I was not impressed. I was told these were dogs with problems and if it were not for their taking them in they would have been euthanized; actually I know they must screen many dogs to get those that don't have tick borne issues. From my point of view it is certainly questionable if being alive in those conditions is better than euthanasia. I personally have no difficulty in greyhounds being blood donors if they are pets first and blood donors second. It was also mentioned to me that they would be open to keeping dogs for the shorter period of time if they had better access to dogs. Unfortunately, I did not ask how long their dogs were there already. I called to ask that information but did not receive a return call. It would appear they make no attempt to alter the way they care for their greyhounds in all reality their efforts are not cost effective. If they have 14 dogs in their blood program and draw blood only once a month they will only get 168 units of blood. The going rate for frozen plasma at the Animal Blood Bank in California is $130.00 per unit or a total cost of $21,840.00. I have to believe it costs the Animal Medical Center a far greater amount and they don't do a good job. In my vision from a business stand point they should simply find homes for the dogs and buy blood from the open market as a more cost effective way of obtaining blood. There is a very nice lady working there by the name of Meriam; whose primary job is to take care of the greyhounds. If Meriam is paid $8.00 per hour and works 40 hours per week, her gross wages are $18,720.00, not including taxes A.M.C. pays. While I was there I met another technician that also worked with the greyhounds and of course other people besides Meriam would have to take care of them. They spend money to draw the blood, to refrigerate it, and to have personnel doing those tasks. Someone has to be responsible for their health and they may actually be paying to take these dogs to New Jersey on a rotating basis. I would think the cost of caring for their greyhounds would be between $75,000.00 - $100,000.00 per year, not particularly cost effective. This analysis will be submitted to Animal Medical Center for review. Long runs 100' to 150' with dogs together, muzzled for safety in side-by-side chain linked fenced runs. This is best with 2 dogs on each side. Draw blood off site, freeze it, then move it to A.M.C. Doctor visits once weekly to draw blood, etc. How much will it cost to do this the right way compared to buying blood? I appreciated the opportunity of visiting your facility on April 14, 2004. I was very impressed with your facility as a whole; I was very unimpressed with the care of your greyhounds and the obvious lack of the Animal Medical Center's concern for a greyhound's quality of life. Enclosed with this letter is an overview from my recent visit. I would hope that the Animal Medical Center will respond with dramatic changes in its blood donor program or elimination of it. The Animal Medical Center is a very high profile organization and I'm sure it does not wish to have its image tarnished because of one area's failure. I recently visited the Animal Medical Center specifically to see how their greyhound blood donors are being kept. I am sending you a copy of the report I sent to them. In my separate letter to them you will see I suggested they completely do away with their blood donor program or just do it right. Doing it right would cost them big bucks, and although they certainly have it I question whether or not they would do it. Let me know about your feelings on this matter, mine are obvious. I have received acknowledgment that you have received my letter regarding the conditions I found with your care of blood donor greyhounds at your facility. I would have hoped to have received a response from you by now. I would appreciate a response as soon as possible. I just spoke with Jacque Shultz of the ASPCA regarding your metting with her of this date. I am saddened to hear your approach was a little more than a band-aid on a serious wound and does not appropriately and truly meet the needs of the greyhounds in your care. I am sorry to say we will proceed to notify the general public of your unwillingness to correct what is in my view many deficiencies at your facility. I spoke with Steve Foxman from the law firm that represents National Greyhound Adoption Program today. He suggested that I offer Animal Medical Center my help and guidance to try to resolve the issues we have regarding the care of your blood donor greyhounds. Before we present these issues to the public I am taking his advice and asking if you would be willing to discuss these issues at length to try to achieve reasonable solutions that will improve the level of care they receive. I ask you to give us a response by Thursday, June 3, 2004 to our office; that response can be by fax if you like. I would hope we could resolve these issues amicably. our visit to AMC on April 14th provided the Animal Medical Center with the opportunity to perform and internal review of the blood donor program. Based on our discussions with you, Jacque Schultz at the ASPCA and advancements in the AMC neighborhood, we have initiated several changes in the donor program. A new dog run has opened near AMC due to the rerouting of the FDR drive. We have requested the New York City Parks Department to reserve the dog run during designated times for the AMC blood donors. We have reason to believe this request will be honored as Parks Department and the ASPCA have a similar program for the shelter dogs in a dog run near the ASPCA. Jacque L. Schultz, certified pet dog trainer from the ASPCA, visited the greyhounds at AMC on May 27, 2004. She made suggestions for environmental enrichment for the dogs. We have ordered the food containing toys: Busy Buddies, Twist-and-Treat, Biscuit Bouncer Footballs. She agreed with our choices of Guma Bones, Galileo bones and Smoked Knuckle bones as chew toys. We also discussed with Ms. Schultz, the options for leashes and collars for walking the dogs around the AMC neighborhood. The conclusion of that discussion was to purchase Halti collars with Martingale collars as the safety collars. Cotton web leashes with small snaps will be used to minimize the weight on the dogs muzzle from the leash snap and the Halti collar. This equipment has been ordered and as soon as they arrive we will begin working with the dogs to familiarize them with leash walking. We have also ordered Direct Stop citronella animal repellant for the protection of other dogs the greyhounds will encounter on their walks as several of our dogs are known to be aggressive towards other dogs. The development of alternate sources of blood is not as readily accomplished as environmental enrichment. As part of our internal review, we have begun to develop a strategy for donor recruitment and screening. Since only 1 in 15 dogs is a universal donor, a large number of potential donors must be identified and tested in order to meet the transfusion needs of AMC's patients, who without transfusion will die. AMC is also considering approaches to collaborating with our veterinary colleagues to host community blood drives. We believe opportunities to work with qualified veterinary professionals will help enhance our blood donor program as we continue to serve our patients who come to AMC for premium care. I appreciate your response to my critique on the Animal Medical Center's care of its blood donor greyhounds and I am pleased that you are addressing some of the issues regarding their care. There were issues you did not address that are important and I would appreciate a response regarding these issues. The ages of your greyhounds and the length of time they have been at your facility. I would like to know specifically how you will be addressing the overweight conditions of some dogs. I would like to know specifically how you will be treating shy dogs and what socialization they may be able to have so that ultimately they could be adopted. I would like addressed the cage sizes and what they are given to sleep on. What measures will be taken for the socialization between the dogs and whether or not you have muzzles on site to assure that cross socialization is not a problem. I suggest when dogs are walked, if there is any aggression, they be muzzled. Some of our adopters will do this although it bothers them to do it. I would appreciate a response regarding their medical care, specifically dentistry. Has it been done, what was done, and when was it done? Detailed proposal of the exercise regiment for both walking and running. The impression I receive from your letter is that there is a far greater concern to have blood on site than the care of the dogs giving that blood. Certainly if greyhounds are to be exploited after racing, they need more appropriate care. I only wish there were qualified veterinary professionals that could advise you. I approve of the University of Pennsylvania's outsource blood program, and Missouri University has recently begun a very good program for its blood donors which includes extensive socialization and little imprisonment. I continue to offer you my professional service as a person that houses, boards, and clinically treats more greyhounds than anywhere in the United States. Below is listed the critique I did while visiting the Animal Medical Center in New York on April 14, 2004. After my visit I contacted the ASPCA to act as an intermediary to see if AMC would change the way they care for their greyhound blood donors. On Thursday, May 27, 2004 Jacque Shultz of the ASPCA met Dr. Hohenhaus of AMC, the only thing coming out of that meeting was a plan to begin walking their greyhounds outside of AMC. When asked about dentals on the dogs, Jacque Shultz's response to me from Dr. Hohenhaus was 'these greyhounds receive dentistry once a year.' We have no way of knowing if it has been done since my visit on April 14th. After I originally sent my critique to Dr. Hohenhaus, two weeks later I sent a letter asking for a response – we never received one. On Thursday, May 27, 2004 we sent an additional letter, which she received Fed Ex on Monday, June 01, 2004 asking for a response by Thursday, June 03, 2004. We have not received a response from AMC. We believe their behavior is not only snobbish but shows a lack of concern for the greyhounds they keep not much better than laboratory animals. We ask people to join us in not only demonstrating on June 22, 2004 in NY, but also volunteers to demonstrate everyday if possible until they end their arrogant stance and change the way they treat their greyhounds. This is a worthy cause for everyone who loves their greyhounds and wishes this condition to end. If you wish to volunteer contact our office for full information. We expect to hand our literature, sandwich signs, and hopefully have the attendance of media. Your attendance will certainly put pressure on this place that thinks they're so high & mighty. Over the last 15 years greyhound adoption movement has become stronger and more powerful each year. We are now able to right some of the wrongs that take place in the care of the greyhounds we cherish. Recently National Greyhound Adoption Program learned about greyhound blood donors at the Animal Medical Center in New York City, although they have been using greyhounds as blood donors for a number of years, we just became aware of it. In April of 2004, I visited and gave an evaluation back to AMC, which in my view was atrocious. Since my original letter to them they have now stated they are reviewing their blood donor program, I personally felt their response was gratuitous in nature and they were primarily concerned about the dogs they were treating and had little concern about the dogs being used as donors. We are currently arranging what we hope will be a large demonstration on June 22, 2004 at their facility. If you are geographically in reach, we would hope you would join us. If you would like to send a letter directly to AMC, their address is listed below. Ideally we would like to have demonstrators in front of their building or near it on a continuing basis 7 days a week until they either eliminate the greyhounds they are currently using as blood donors or make dramatic changes in their treatment and living conditions. In order to have a significant impact we need more than one demonstration. We have a volunteer that lives close to AMC who can have the supplies necessary for the demonstrations, such as: sandwich signs, display signage, and literature. If your program has the ability to help us, either on June 22, or any day after, please contact our office immediately. Everyone participating will either receive a complimentary t-shirt or baseball cap commemorating their participation. Many greyhound programs do not get along for many reasons; this is one area where every program should be interested in a common goal. It has nothing to do with the racing industry or adoption program competition, it has to do with one thing all adoption programs agree on: greyhound exploitation. You will be helping us, but more importantly you will be helping the greyhounds confined at AMC and the ripple effect it may have on other facilities if we are successful. This is a formal request for Animal Medical Center to submit copies of federal 990 returns for 2002 and 2003. Enclosed is a self-addressed stamped envelope. I would appreciate a punctual response. Fifteen years ago the National Greyhound Adoption Program was formed. During that period of time we have adopted out over 5900 greyhounds. In the course of a year we will care for thousands of greyhounds; either being kenneled for adoption, housed for a short period of time in boarding, or passing through our clinic for health related issues. Also during that past fifteen years we have gained substantial knowledge on the care of greyhounds. In April of this year I visited the Animal Medical Center in New York and their greyhound blood donors. I was very disturbed that the greyhounds they had were not appropriately cared for and were treated much like laboratory rats. Beginning June 22, 2004 & there after, National Greyhound Adoption Program and supporters from many other adoption programs will demonstrate at the Animal Medical Center. As a person who has seen greyhounds exploited in their racing careers, this additional exploitation from an organization with almost unlimited resources is totally unforgivable. There are many alternatives for blood donor programs that do not imprison their blood donors, and there are also places where most of the donors are adopted pets and are in the blood donor program to help save the lives of other dogs but are not subjected to lock-down. National Greyhound Adoption Program is the largest independent greyhound adoption & advocacy program in the United States. We believe there must be a substantial change at the Animal Medical Center. We would be happy to take all of these greyhounds into our facility and make them adoptable and free them from their prison. Enclosed: a review of my inspection at the Animal Medical Center in April 2004. We have not completely defined all of the plans and depending on the media coverage and when they wish to come out will influence our start time, more details and directions will come next week. We expect to have special embroidered baseball hats for everyone to wear and possibly t-shirts. We expect to list parking spaces near the facility, and we will ferry people and dogs to the site with NGAP's limousine. We will provide poop bags, water for the dogs, snacks for the dogs and people, we will be communicating with walkie talkies, and will have first aid supplies with us. What we're doing may have significant impact on the 14 greyhounds at AMC and the ripple effect it will have across America for greyhound blood donors. Put your political issues aside, this is for the dogs!! New York, New York is a wonderful town except when it applies to greyhounds. In New York you have an outstanding facility; the Animal Medical Center. However, it is not outstanding in the care of the greyhound blood donors it imprisons. In reality they should either end their blood donor program or move their dogs to where they can be humanely treated. Hopefully your office can influence the Animal Medical Center so that it can remain one of the stellar parts of your city. Beginning next week demonstrations will occur at their facility and will remain until something is done for these dogs. This firm represents the National Greyhound Adoption Program. 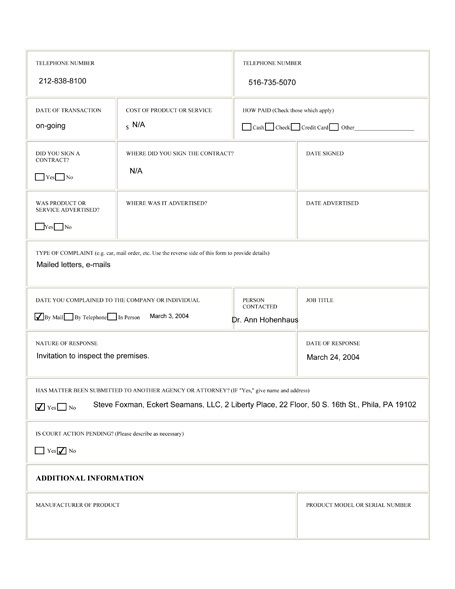 Please provide the undersigned with a copy of your Federal Form 990. Thank you for your cooperation. Back in 2004, we had an excellent rapport with Hills Pet Nutrition at a very high level. During one of my conversations, I was given Dr. Guy Pidgeon's, direct phone number and since we had not hear from them, I decided to use this confidential number. It was not a lengthy conversation but its content was very important. I mentioned to him that it was now several months since my visit and I had asked what they had done about the periodontal disease I had seen in their greyhound blood donor dogs. I remember very clearly that he said he had not had an opportunity to get around to it. I told him of my distress at hearing that and he informed me that he would look into it. The conversation then ended. I sat and thought to myself, here we have the largest private vet facility in the United States, with 200 doctors, and they couldn't find the time over three or four months to do dentals and extractions on approximately 15 greyhounds. I can only tell you that if those dogs had been in our kennel and someone had approached me with this damning info that my blood donors had periodontal disease, we would have begun the process of taking care of dog #1 within 24 hours and by weeks end they all would have been done. Keep in mind that we only have two vets, not 200. 1.AMC could not afford to send their dogs off-site. 2.A community program would be investigated but may take a considerable period of time before it could be started. When asked whether the greyhound blood donors in-house had dental work done, the response was that they have dentistry done once a year. When asked specifically due to our investigation that all dogs needed dentistry, the response was that they are trying to work it into their schedule. Our inspection was in April. National Greyhound Adoption Program has offered to take all of their greyhounds in and care for them at our facility, making some financial arrangements with AMC. It is our belief that we can give them better care although it would certainly be a distraction to our normal routines. As of this date we have received no response from our letter dated June 3, 2004 a copy of that letter is enclosed. Please advise if you plan to cover this demonstration. We were not getting any cooperation from the Animal Medical Center and I felt that we must, at least once, demonstrate to show our concern about their greyhound blood donors. Emails and other communications were sent to multiple greyhound programs and adopters in hopes of soliciting as many demonstrators as possible. Sandwich board signs, t-shirts and hats were specifically prepared for this demonstration. Demonstrating in New York requires permission and notification to the New York Police Department. We went through all of the appropriate steps and when our seven volunteers arrived in our donated NGAP limo, including myself, my son, and two of our greyhounds, Iceman and Phantom, we found that the police were already there and ready for anything. Although no one was wearing riot gear, there were twenty-some policemen on hand and barricades as far as the eye could see. During the demonstration, only one person was permitted to walk past the Animal Medical Center and that person was not allowed to stop in front of the building at any time. The AMC staff appeared to be very upset with our activities. Senior executives stood under the AMC's small doorway canopy to greet any potential clients, hand out an information sheet giving their spin on what we were doing, and whisk them by us. They even had their attorney on hand, just in case. We had hoped to have media attention, but as it turned out, Bill Clinton was in town autographing his new book. And, of course, it was raining. When we finally left, we lowered the windows of the limo and waved goodbye and told the Animal Medical Center we would be back. We did everything we were permitted to do. I was only so sorry we couldn't do it everyday. When you enter AMC, think about the greyhound blood donors that may be used to save your dog's life! 1.Received inadequate medical treatment at a facility with 200 staff vets. They almost never go outside. Some are very overweight possibly because of wrong diet and lack of exercise. Some will be prisoners for life. They are treated like lab animals. They must relieve themselves in their cages. Until recent pressure on the AMC few donors had toys. Animal Medical Center claims they can't afford to house them off-site. Does that mean they've spent all of the 26 million-dollar annual budget they have? Greyhounds are exploited much of their life in greyhound racing. Now at the AMC the exploitation is worse! They say it's better than euthanasia! I'M NOT SURE! 'The Animal Medical Center's lifesaving and compassionate greyhound blood donor program has saved the lives of thousands of other dogs over the past 25 years. Our donors are provided premium levels of care to ensure that they are happy, healthy, and free of germs and disease. They have been adopted to caring and loving homes after they leave. The Animal Medical Center stands completely by the integrity of this program. 'The Animal Medical Center believes that it is vitally important that the supply of blood be controlled as closely as possible to maintain strict standards for purity. Since our medical staff sees approximately 60,000 patient visits a year, therefore performing thousands of procedures, AMC needs a safe, and predictable supply of blood and blood products. 'For this reason, we have always maintained a colony of donor dogs, rather than rely on external sources for the blood. 'We appreciate the work of the many rescue groups that have developed over the years on behalf of finding homes for greyhounds who otherwise would be put down after their lives in racing are over. The Animal Medical Center is a non-profit veterinary hospital with a staff of more than 90 veterinarians specializing in more than 20 areas of medicine and surgery. Since 1910, we have provided the highest quality veterinary services. While most of our patients are companion animals, we have treated lions, tigers, and recently a police horse who was injured in a collision with a taxi. The Center also is a research and postgraduate institution. The Center is dedicated to treating our patients with the personal attention and care that a member of our clients 'families deserve. For more information, please visit our web site at www.amcnv.org. You missed hearing from me over the last several weeks because I had major back surgery, but AMC is still high on my list of concerns. When we demonstrated at your facility the handouts you gave everyone told of your concerns of the quality of blood you use. I believe that to be hypocritical because prominent veterinarians in the blood donor industry tell me that dogs with high bacteria in the mouth due to dental problems affects the quality of the blood. In many cases other blood donor programs will reject a dog because of that issue. After speaking with several people in the industry, it's hard for me to believe the blood you draw from your prisoner greyhounds is any better than what can be purchased from a reputable company. Other than Jean Dodd in California, none of the other programs house greyhounds and many feel their blood is inferior. You, like Jean Dodd, use greyhounds because they are easy. You specifically told me in our last conversation on one hand the dogs had teeth cleanings annually and the blood donor dogs in question still had not been done after my visit in April because your dental veterinarian was too busy. I must remind you during my visit I pointed out that every greyhound needed dentistry. Apparently you don't care. It is hard for me to believe you are so concerned about the quality of blood and on the other hand you ignore the problem that impeaches that blood. You also discussed with me your inability to have an off-site location for your blood donors because of budgetary reasons. Anyone reviewing the 990 of AMC would probably disagree with your assessment. I do not know of many places in the United States where vets are paid $250,000.00 per year for a 40-hour workweek. They must be awfully good. AMC has a net worth of $73,000,000.00, an unrestricted asset of $49,022,898.00 and annual revenue of $31,215,777.00. In the future I hope you would notify this office of any changes you make in your blood donor program so we will not falsely accuse you of anything. We have been informed that you are a trustee of The Animal Medical Center and I am sure their stellar reputation is very important to you and other trustee members. I have enclosed documentation about the treatment received by the blood donor greyhounds at Animal Medical Center, which not only in my eyes but also in the eyes of responsible veterinarians is grossly inappropriate. If AMC wishes to continue to use greyhounds as blood donors they must be appropriately cared for with the commitment to spend whatever monies necessary to take them out of their prisoner-like status. I have spoken with many people and all have come to the same conclusion but have been hesitant to speak up in the past, fearing some retribution. AMC has a huge budget, paying some staff members very large sums of money, having large reserves, in my view you do not have a reasonable monetary excuse for not properly caring for your greyhound blood donors. I would be happy to discuss this issue with you at any time and explain to you why through my experience I can make the claims I make. As long as this problem exists the National Greyhound Adoption Program will be there to combat it and try to change it. I must disagree with Dr. Pidgeon's note, we are definitely not misguided and I assure you that my review is accurate. P.S. 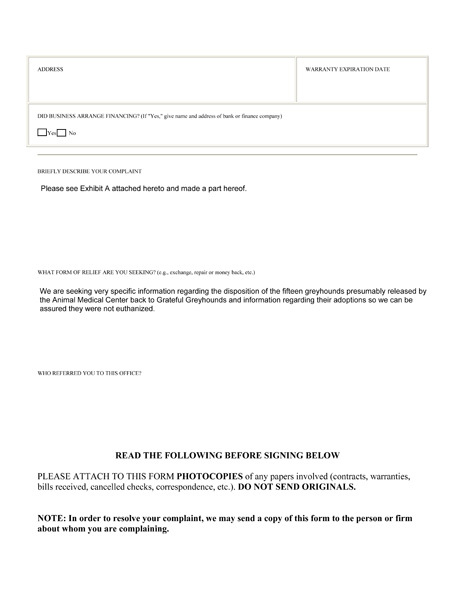 To assure you have received this letter please sign the enclosed form and return it to our office. Have all dogs had dentistry? Have there been any extractions? How often are there teeth cleaned and checked? This issue alone surely impacts the quality of blood you draw from them. There were both shy and overweight dogs in your care. How has that changed? Have you tried thyroid supplement on the shy dogs? A major university is now doing a study on thyroid supplementation. Has anything been done to make their cages comfortable? Have their water dishes been changed to a size that would take up less room in their cages? Do they have more toys to play with? I have been notified that they now get out for walks. How often is this done? Has any thought been given to releasing any of the dogs? If so, we would take them to adopt into homes. Has any thought been given to eliminating your blood donor program? In April of 2004 I visited the Animal Medical Center, what I believe to be a prestigious organization both in New York and across the country. What I have learned over the last year and half plus is that the Animal Medical Center has many fine points but as it relates to greyhounds its treatment can best be described as slave blood camp. This facility has a budget in the neighborhood of twenty-six million dollars per year and a Board of Directors to impress any charitable organization. However, when it comes to its greyhound blood donors not only is it not charitable but in my view it exploits them and through lack of caring abuses them. Whomever I speak to about them describes this as an air of arrogance that no one can go up against and they shun all criticism. I am sending you my original report from my visit to their facility. To this date I know the following things have not changed: their cage sizes have not changed, their water dishes have not changed, their bedding (if you can call it that) has not changed, but the number of greyhounds they house has increased. When I visited there were fourteen greyhounds they now hold seventeen. I do not know if they have had their teeth cleaned. Two months after my visit I spoke to Dr. Guy Pigeon, the director of the Animal Medical Center, I reminded him of the greyhounds dental problems and the issue of them having periodontal disease which affected the quality of their blood, he told me he had not been able to work them into the schedule for dentistry. That response is honest but absurd. If those dogs were to come to our facility that work would be done the next day including any necessary extractions. We solicited help from the New York ASPCA, the oldest Humane Society in the United States, they are apparently afraid to go up against them, afraid to make waves. One year after my visit to AMC I wrote a letter to the veterinarian in charge of the greyhound blood donors Dr. Ann Hohenhaus, she did not respond. I spoke with the New York ASPCA and when they finally called months later the response from Dr. Hohenhaus was that they would not comment on any of the issues I had brought up. When I was there and asked how often they were out to walk, the answer was “Never.” I know they have now instituted a walking program of volunteer walkers. They had three walkers, two of those walkers were recently discharged. So now they have one walker for seventeen dogs. I do not know how often they are walked or if they are ever walked. I have heard that some are available for adoption but have heard of no way that the information is distributed to facilitate such adoptions. When one walker posted information about the greyhounds for adoption at her local vet clinic, a member of the AMC Board of Directors saw it and had her dismissed from her volunteer walking chores. There are times when life can be worse than death; racing greyhounds are exploited from the time they are born throughout their racing careers. They are often abused and mistreated. Their quality of life at AMC is worse than death. More and more lucky greyhounds are finding adoptive homes and by the same token more and more veterinary teaching facilities are changing their policies regarding the use of greyhounds as blood donors. The University of Pennsylvania that kept greyhounds as blood donors now for many years has had a blood mobile. They are one of the largest collectors of blood in the U.S. from volunteer dogs both greyhound and other breed. Ohio State has a greyhound blood donor pool, which consists of all adopted dogs. They come in on a regular basis to help save the lives of others and sometimes they are used for clinical research. However, they go home at night and have regular teeth cleanings. Colorado State University has completely changed the way it deals with greyhounds. Previously they would kill approximately nine hundred greyhounds each year, half of that in terminal surgeries and the other half just as an accommodation to greyhound racing. That has all changed. The Animal Medical Center does not wish to change; it is not receptive to criticism and simply thinks it is above it. Some doctors there take home salaries of a quarter million dollars per year – impressive to say the least. The Center has a huge reserve of funds that could completely change the way it cares for blood donors if it continues to use them. In actuality it would be far less expensive to buy blood from commercial blood banks. There is only one place in the United States that will supply greyhounds as blood donors and certainly Prisoners of War, that place is Bridgeport, Connecticut Greyhound Track. I have recently written to Connecticut Governor – M. Jodi Rell to see if she will reverse this track's position. Does your newspaper have the Will or courage to publish this information? It would only be through public criticism and the potential of losing donor money that AMC would begin to treat their in-house blood donors humanely or better yet close it down. National Greyhound Adoption Program has been adopting greyhounds for over sixteen years. We have found homes for over 6,000 greyhounds. Our clinic does more dentistry on greyhounds than any other facility in the United States, approximately two thousand each year. We are strong advocates for those greyhounds that cannot speak. Thank you for the nice note you sent during the closure of the Plainfield Greyhound Racetrack. I bring to you a much more serious concern having to do with the Bridgeport Track. They recently had an incident where a lead tied the tail of a greyhound to a starter box, subsequently; the greyhound's tail was ripped off. As unfortunate as this case is it is not nearly as bad as Bridgeport's ongoing commitment of giving the Animal Medical Center of New York greyhounds for the purpose of being blood donors. Somehow the powers at Bridgeport believe that continued life even as blood donors is better than death. If you are a blood donor at the Animal Medical Center this is not the case. Since my visit to AMC in April of 2004 the number of greyhounds there has increased. Their care and treatment has not gotten any better. Sources other than myself have verified these conditions, including those that were in the facility multiple times. Although AMC is not in your state the greyhounds they hold are coming from your state. I know of no other adoption program in the United States that will supply greyhounds for these purposes and the associated treatment they receive. If you do not know better you may be fooled into believing they are treated well, but if you know how greyhounds have been treated prior to being prisoners as blood donors this continued abuse should not be tolerated. I beg you to use your influence as Governor of your fair state to pressure Bridgeport to change this procedure and have all greyhounds from AMC returned so they can ultimately enter adoptive homes. We would gladly take them all. I am sending you significant documentation dealing with my concerns about their treatment and the position of AMC regarding that treatment. Thank you for your consideration. It has taken me a while to get around to writing this letter. The subject has been festering in my mind since our last conversation. The subject of course is the Animal Medical Center and my strong feelings of their flagrant disrespect for the greyhounds they use as blood donors. I was aware they instituted a dog-walking program using volunteers. To the best of my knowledge they have fired two of their volunteers and are now down to one volunteer. How can you fire a volunteer? I guess when you say your services are no longer needed to walk our dogs. The information I have spells out that there has been no improvement in the lives of the greyhounds imprisoned at AMC and now they have more. Still they have no bedding, still their water dishes are too big, and still they do not get appropriate exercise or handling and communication of people. Presumably some are available for adoption. Just how does that work? How many have they adopted? What are they now doing differently that makes these greyhounds suddenly more adoptable? The one organization that has the ability to pressure them to bring about change is yours. Yet the ASPCA chooses to do nothing. Isn't their care and their treatment part of the goals you aspire to? Why can't you challenge AMC? After hearing about recent events it has only strengthened my will to try to have these dogs lives improved. We would carte blanche – take them ALL and I know give them a better life. Harvey is at least ten years old and a spook. He is considered unadoptable, we would gladly take him. Perhaps your organization can re-think its policies. Perhaps you too can make a stand for those seventeen greyhounds. I await your response. The Division of Special Revenue has been forwarded a copy of your correspondence, dated October 31, 2005, addressed to Governor M. Jodi Rell concerning the closing of Plainfield Greyhound Park and a concern you have with Bridgeport Shoreline Star Greyhound Park. In your letter you refer to an unfortunate incident that occurred at Bridgeport Shoreline Star Greyhound Park, which resulted in criminal charges against an individual for animal cruelty as well as the revocation of three Occupational Licenses for personnel working at the facility. You go on to say that the incident pales in comparison to Bridgeport Shoreline Star Greyhound Park's commitment to the Animal Medical Center of New York to provide greyhounds for the purpose of being blood donors. Your concern appears to be of the treatment the greyhounds receive while at the Animal Medical Center of New York. It is my understanding that Bridgeport Shoreline Star Greyhound Park has provided greyhounds to the Animal Medical Center of New York. There is no long-term commitment between the two facilities and only one or two greyhounds are sent from Bridgeport's adoption program at any given time. When a greyhound is sent to the Animal Medical Center of New York the greyhound is there for a specific timeframe and is always returned to the Bridgeport Adoption Program for placement in a home. Bridgeport Officials have had no concerns about the care the greyhounds receive while they are at the AMC facility and there has been no indication of abuse or neglect with any of the greyhounds returned to Bridgeport's Adoption Program. I want to thank you for taking the time to express your concerns about the Animal Medical Center of New York. I hope the information I have provided concerning Bridgeport Shoreline Stars relationship with the Animal Medical Center of New York has been helpful. We have contacted Bridgeport's Adoption coordinator and advised her of your offer to assist in the placement of any greyhounds. Thank you for your response on behalf of the Governor regarding the conditions at the Animal Medical Center dealing with the care of greyhound blood donors received by a track in your state. I am sending you once again my review of those conditions, which I believe to be totally unacceptable and not humane but exploitive and still exist today. You make reference in your letter that greyhounds are there for only a specific amount of time and then are returned for adoption. I do not believe that to be true, if it is true I would like to see evidence. The information I have is that donors are rarely adopted and some are “lifers” – no different than prisoners except that they have committed no crime. Out of three volunteer walkers one was discharged for encouraging their adoption. Another was discharged shortly after, leaving one volunteer walker for seventeen dogs. Animals confined to small area cages/cells, certainly without sufficient room to exercise. Prisoners get outside for fresh air, greyhounds at AMC rarely do! The information we have is that the greyhounds are rarely walked. I was told their teeth are taken care of as needed, which is a prime concern for a greyhound's health. My personal inspection showed that all were in need. Every single one. I have heard about raw rear ends due to lack of comfortable bedding. I witnessed dogs being overly shy with no treatment options to make them feel better. Nothing they do there prepares them for ultimate adoption. What about this description makes you believe the treatment they receive even approaches acceptability? It doesn't, and to say it does is an untrue statement. Perhaps another inspection with the ability to bring up records showing all dogs coming in and being there over the last two years and proof of where they are now and an inspection, which includes a review of the conditions in which they live I would be happy to join someone from the State of Connecticut to give myself and others assurance that anything you say in your letter is the truth, the whole truth and nothing but the truth. I believe the Governor deserves nothing less. I appreciate your response. If you find what I have outlined to be correct, if they are unwilling to allow my re-inspection with a representative of your state. I ask you to demand their return and we will give and find them a loving home. You can reference our organization on our website www.ngap.org. I was sitting in a doctor's waiting room this morning looking through the New Yorker magazine. I came across an advertisement, which I have enclosed to you. The ad depicts your organization helping those animals that cannot speak for themselves. The Animal Medical Center's greyhound blood donors should certainly fall into that category. Where is your voice for them? Forgive me for not getting back to you sooner about your letter regarding the AMC blood donor program. As soon as I received your letter, I brought it to the attention of Dr. Stephen Zawistowski who in turn discussed it with both our President and Chief of Operations. At this time, they have made the decision to not move forward on challenging the Animal Medical Center's blood donor program and protocol. I'm sorry that we will not be able to offer you support in your campaign to restructure their blood donor program. I just received the Spring Edition of ASPCA Action. It is a lovely magazine. I see a picture of a greyhound on page 4 and I feel it is wonderful that you support greyhound adoption. The things that make an organization truly wonderful are that they are willing to take on politically difficult situations because it is right for the animals. If you had been with me when I visited the Animal Medical Center in New York perhaps you would feel the same as I do. I feel very remorseful for the captive greyhounds there. Everyone I have spoken to since my visit there agrees that they are getting away with further animal abuse, cruelty, and exploitation. For you this should be easier since AMC is in New York and they are on par with the ASPCA's budget. They can either do away with their blood donor program or do it so much better. However, they are the Animal Medical Center and no one challenges them. What a shame. Here is an area where the ASPCA could really do something to speak for those without a voice. Enclosed is a letter that we are forwarding to every greyhound program that would potentially be taking greyhounds from the closure of the Bridgeport Track. Here is an opportunity for the State of Connecticut to make a clean sweep and retire greyhound racing, gaining the respect of greyhound advocates and adopters across the country. I once again enclose to you a copy of the inspection I made at the Animal Medical Center in April 2004. To the best of my knowledge all of those greyhounds came from your Connecticut tracks. Please get those greyhounds back so they will have the opportunity to live a good life. As I have stated to you before, our organization would gladly take all greyhounds from the Animal Medical Center. In April 2004 I visited your facility and was given a tour starting on the top floor and working our way down. Ultimately, we reached the area that was my primary reason for visiting, to look in on the greyhounds you retain as blood donors. I enclose with this letter a copy of that report. More than two years have passed since that inspection and beyond knowing that they now go out for walks and are permitted outside of the building, little seems to have changed. Back then our attorney requested a copy of the 990 Form you file with the Federal Government each year. For the year 2002 you had gross receipts of $35,795,000.00 with net assets of $73,000,000.00. Your 2005 990 Form shows gross receipts of $50,187,000.00 with net assets of $85,310,000.00. With all these resources you have somehow managed to overlook taking better care of the animals you claim are so important for the operation of the Animal Medical Center. National Greyhound Adoption Program has been attending and exhibiting at the nation's largest vet conference, the North American Veterinary Conference (NAVC) which takes place in Orlando, Florida, for the past seventeen years. At no time, until 2007, has the Animal Medical Center made its presence known to us at that conference. In January of 2007, as my wife and I were going to set up our booth, we noticed that there was a table that said 'AMC' just two booths away from us. We thought that was grand! We already had information with us on our view of the AMC's exploitation of greyhounds, and what more could we ask for than having their booth ten feet away from us? Exhibiting was supposed to begin on Sunday, and yet on Sunday, no one appeared at their booth. No one appeared at their booth on Monday either, and we finally discovered that they had moved their booth from the Gaylord Palms Hotel, where a great majority of the exhibitors were set up, to the Marriot Hotel, where there were only a few exhibitors. When I had the opportunity I went over to visit, and there, behind the booth, was one of the people I had met when I was at the Animal Medical Center in 2004. The lady representing the AMC apparently did not wish to talk to me or respond to my questions and after about two minutes of discussion with no answers, threatened to call security and have me physically removed from in front of her booth. I assure you that I was doing nothing erratic. I was not even raising my voice. I was simply asking what the AMC was doing about their blood donors. Obviously, they were not happy with my visit. But of course, this is the AMC, one of the largest, if not THE largest, vet facilities in United States. What could they possibly have to fear from National Greyhound Adoption Program? On December 1, 2006 I forwarded you a letter regarding the care and treatment of your greyhounds used as blood donors at the Animal Medical Center. I have not received a response and so must assume that other than the four greyhounds I was told were adopted and that the rest were walked daily, that not much has changed. In my view as a person that takes care of many greyhounds this is not appropriate for an organization of your stature. As I have stated before I would be happy to visit and make suggestions on how to improve the accommodations for your greyhound blood donors. I truly believe they would be better off somewhere else, better off adopted as opposed to exploited. I would hope some dialog can be started because we will not go away. We will continue to inform those uninformed about the Animal Medical Center and its lack of compassion. I met with Maryann Kubacz at the North American Veterinary Conference, and if I was not convinced prior to the meeting I was certainly convinced afterward that her reluctance to even discuss the greyhound blood donors was an indication that they remained improperly cared for. There are so many areas of deficiency that you can no longer hide and as long as I am able I and National Greyhound Adoption Program will continue in our quest to better the lives of those former racers. Many of us are aware that greyhounds have been favored as captive blood donors to most veterinarian universities and veterinarians for many years. They have certain good qualities making them good as a donor as well as many bad qualities. Most importantly they are easy and will just stand there permitting you to draw blood without difficulty. The Animal Medical Center in Manhattan, New York is one of those facilities using greyhounds as blood donors. It may be one of the largest, presumably non-profit, veterinary facilities in the U.S. with at least 100 staff vets and another 100 residential vets. It sits in a seven story building. I had occasion to visit per my request in April 2004. I believe they thought I would be impressed. I was not. At the time they had fourteen greyhounds in the building. When I first entered I noticed one of the overweight greyhounds walking the aisle-way, this was their only exercise. I went to the first cage to investigate the dog's teeth. It had severe periodontal disease. The conditions were the same in the second cage. Although I did not investigate all cages, every one I did check was greatly in need of dental work. How often do they get their teeth cleaned? The answer was: 'On an as-needed basis.' It was apparent that is was needed by all. What, if anything, was done to make them adoptable? There was no answer. I was told occasionally they go to New Jersey where a staff member raised Irish Wolfhounds on a farm. While there they would have the opportunity to go into the runs. The runs are six foot by eight foot indoor/outdoor runs. I do not consider that to be a sufficient run for a greyhound. Under the circumstances I considered their quality of life to be absolutely terrible. Two months after my visit I spoke to Guy Pigeon, who was the Animal Medical Center's president at that time. He told me they were too busy to do the dentistry the greyhound blood donors needed. Now almost three years have passed since my visit. I know they now have dog-walkers. Beyond that little else is known. It is believed they now have nineteen greyhound blood donors. This year for the first time they exhibited at the North American Veterinary Conference in Florida, which gave me the opportunity to once again address my concerns. The person at the exhibit was the lady with the farm in New Jersey. She did not wish to speak with me and told me to leave her booth. She did tell me four of their greyhounds were adopted last year. I have to assume her reluctance to address the issues could only mean little to nothing has changed at the AMC. In 2005 the Animal Medical Center had a $31,000,000.00 budget. We would think they could invest some capital to improve the conditions of their blood donors. I wrote to the chairman of the board, Katherine Johnson-Raynor in December 2006 and again in January 2007. I am yet to receive a response from her. I suggest everyone interested in the welfare of greyhounds also write to her. For a full copy of my visit to the Animal Medical Center in April 2004 please visit the link on our website www.ngap.org. Enclosed is a photo showing one of our new 4' x 6' runs. Note that it has plenty of room for the dogs to move around as well as having a comfortable bed in the back. Maybe the Animal Medical Center should consider runs of this type for their blood donor greyhounds. Considering the prestigious Animal Medical Center's budget, this expenditure should certainly be well within your means! Please advise if anything has improved in regards to your greyhound blood donors. When were their last dentals done, and will you give some or all up for adoption? Now that we have a substantial email list, I believe it is important to remind everyone of one of the biggest abuse areas of greyhounds that occurs at what is sometimes called the Veterinary 'Mayo Clinic'. The Animal Medical Center has been a target of ours since 1994 when we visited their facility used to house former racing greyhound blood donors. They permitted my visit, I assume, because they may have believe I would be a source of greyhounds. The Animal medical Center is an impressive institution that does many good things. Its use of greyhounds is not one of them. When I entered the kennel area, one of the dogs was getting its daily exercise. Exercise for greyhound blood donors consists of walking the aisles at the kennel. Most of the dogs were overweight, many were spooks and their living quarters were far too small. Each dog had a small cot to sleep on which was too small for their size. There was no bedding and there were no toys. In each cage was a large two gallon bucket of water, taking away valuable space in their already cramped living quarters. I can imagine they were surprised when I looked at the dogs' teeth, cage after cage. All the dogs needed dental work, most had periodontal disease. A few of their mouths could be described as atrocious. When I asked when the dogs teeth were cleaned, I was told it was done on an 'as needed' basis. Obviously, no one was paying any attention at all. From my visit, I perceived that none of the dogs were being helped in any way to make them adoptable and that any adoptions would be a fluke. They don't like to talk about their blood donors. They don't like people to see their blood donors. The administration kept visits very restricted and it was not until after my visit and several letters later that they actually permitted the dogs to go out of the building for walks. When I called the then-president of the AMC two months later to ask about whether or not the dogs dental issues had been addressed, he said they had not gotten around to it. The Animal Medical Center has a staff of 200 veterinarians. 100 of those veterinarians are there as residents and the balance are salaried staff. The top doctors make somewhere in the neighborhood of $250,000 each. The AMC's current annual budget in 2006 was $31 million dollars. The last time I confronted someone from the AMC at the North American Veterinary Conference, you would have thought I had a gun. They threatened to call security and have me removed from their booth. They believe they are above it all. When you relay stories about the exploitation and abuse of greyhounds, tell people about the Animal Medical Center. They haven't changed. They think they are the best when really they are no better and in some cases even worse, than the greyhound racing industry. In 2004, we demonstrated in front of their building in New York City. We had seven demonstrators. Twenty-seven police officers were called to watch us. All of the AMC's big executives were down at street level to meet their clients so they would avoid us. They were, and are, frightened of what we can do. Could we tarnish their image? We would love to demonstrate again, but we need volunteers willing to take a day off and go to NYC. We need to let them know we have not forgotten. Whether it is one person, or twenty-one, we need to remind the world that the Animal Medical Center has a dark side. As greyhound lovers and advocates, that is one of the reasons why we're here - to remind people about the dark side. Have a happy holiday. In January 2008, the Animal Medical Center had a younger girl helping them with their exhibit at the North American Veterinary Conference. She had come to our booth and purchased one of our greyhound wrap-around t-shirts. Of course, we told her how bad we thought the AMC was and why they shouldn't have greyhounds at their facility. They of course, were again exhibiting at the Marriott Hotel instead of the more populated Gaylord Palms where NGAP was. Later, when I went to visit the exhibitors at the Marriott, I came across the Animal Medical Center's booth and saw the same young lady - and guess what? She was wearing our t-shirt! I went over to her and told her I believed it was an insult for her to be wearing a greyhound shirt based on what we stood for and based on the way they treated their greyhounds. And so the meeting ended! Looks like we are ready to go with our Blood Bank partnership. As I mentioned before, David Wolf from NGAP in Philadelphia has graciously offered to help placing or to take all the dogs. I am ccing him in case you want to communicate with him directly. Please let me know if we can help. I am writing to you on behalf of the owners of all of the greyhounds placed with the Animal Medical Center. We have knowledge through a representative, sampling of the dogs being used, that they have been placed as blood donors contrary to the direct wishes of the greyhound owners. You have, therefore been misrepresenting your organization's procedures or actions. We believe this misrepresentation constitutes a violation of New York State Law and unless these greyhounds are removed from the Animal Medical Center immediately, legal action may be taken against your organization and the Animal Medical Center for their release. I personally consider giving greyhounds to a blood bank without the owner's/donor's consent, a violation of the core principles of what those people involved in greyhound rescue and adoption believe so strongly about. Greyhounds that have been exploited for racing for two or three years or more certainly need no further exploitation for four or five years as a blood donor, under any circumstance. There are many options available to the Animal Medical Center other than having captive greyhounds and using them because they are universal donors and easy. This is not an acceptable reason for their long-term confinement as blood donors. Please consider this notice that we expect you to release all of the greyhounds that you currently have in your possession. Prior to your obtaining those greyhounds, you did not seek or obtain permission from the legal owners for those greyhounds to be used as blood donors. The owners were told they were going to be adopted, not confined indefinitely to be used as blood donors. These misrepresentations are against New York State Law and we demand an immediate response to our demand in accordance with the requirements of New York State Law. Congratulations to you and your staff on convincing AMC to permit you to supply blood to their facility which will in turn lead to the release of all the greyhounds presently held by AMC. Although our relationship with AMC is strained to say the least, this is about the dogs and we would be happy to bring them to our facility for ultimate adoption. Possibly that sometime in the future when we complete the move to our new facility, we can be a source of greyhound blood to help other dogs. Chances are the next time we meet, I won't be nearly as critical as in the past (private joke). I am sorry I was unable to speak with you today. I would hope that you are anxious to see the successful placement of the greyhound blood donors that you now have at your facility. Hopefully, some action will be forthcoming to avoid any potential legal action. I would hope to get some form of response from you in the next day or so so that I can find some direction. It was good speaking with you yesterday regarding the departure of your greyhound blood donors. My four year quest to see the blood donors release from your facility was not just because the owners had not given their permission for the dogs to be there. I firmly believe that your institution with the stature that it has, should have the financial resources to appropriately care for and house blood donors in its care. I am enclosing a copy of my initial evaluation to assure that you have an opportunity to read it. For a facility such as yours to have blood donors all with periodontal disease, is to me appalling, the report speaks for itself. For the record, all of the greyhound owners that we spoke with whether they are in your facility or other blood donor facilities, have unanimously said that they have never authorized their greyhound to be used on a long term basis and in most cases never to be used a blood donor. The fact that four years after my visit, the 'colony' still exists when the faults of that colony were pointed out so vividly, it's shameful. We knew that once some of the greyhounds were released, we would find evidence of misrepresentation and that is what we found. I would hope that the release of these greyhounds should become a priority, especially since you now have other sources of blood, which is what I suggested four years ago. I am sure that many of the greyhounds there now were there then. Would you treat your own dog this way? Greyhounds are loving and affectionate canines brought into this world and exploited because they can run fast. At least as racers they had an opportunity to be out in the sun and run truly as only a greyhound can run. When was the last time your greyhounds were able to run? As you promised, I will be expecting a response from you withing two weeks and I would hope by then that the response will either be the dogs are imminently going or gone. I once again, repeat our offer to you, to take all of the greyhounds to our facility for adoption and I would only ask you to pay for our cost to bring the dogs up to our standards of adoption criteria. This letter will hopefully outline our position regarding the Animal Medical Center greyhounds and why it is so important to get them all out. I run the National Greyhound Adoption Program. It is one of the oldest programs in the United States. We have adopted over 6,000 greyhounds over the last 19 years, we can house up to 100 greyhounds in our facility and board greyhounds for their owners when they are on vacation and we have a clinic that will see more greyhounds under surgical protocols than anywhere in the U.S. We know how to take care of greyhounds, and we know when they are not being taken care of. In April 2004, I visited the Animal Medical Center and had the opportunity to see up close and personal the environment in the conditions in which they lived. My feelings are quite clear, 1 would rather see them euthanized than them staying at the AMC. Clearly Jeffrey Klausner, the new President, best described his greyhounds as a 'colony' of blood donors. They could be compared to a colony of prisoner research dogs or any large group with a horrible disease. I enclosed a copy of my inspection from 2004 it is self-explanatory. We have learned over the past four years that the Animal Medical Center is paranoid in their protection of their 'colony' of blood donors and I for the have looked for that one defining moment that would clearly indicate that Grateful Greyhounds and the Animal Medical Center were in the wrong. We had contacted the owners of some of the greyhounds recently released and they all unanimously said that they never gave permission for their dog to be used as blood donors. Just by coincidence, several older blood donors were released by a blood bank in Texas, and in contacting these owners, their feelings did not differ. The National Greyhound Association is in agreement that long term confinement of greyhounds for the purpose of using their blood is not an acceptable practice. Probably even more important than the owners not giving permission for the use of their dogs is the Animal Medical Centers' feeling that these dogs are there to be used, their care and comfort are of little importance. The ultimate irony is that every dog I saw in 2004 had periodontal disease and that simply meant that the quality of blood being drawn from their bodies was compromised because of the continuous flow of bacteria into their blood stream compromises that vital blood they are giving. Two months after my visit nothing had been done to clean up their mouths, the then president of the Animal Medical Center Dr. Guy Pigeon, said they did not get a chance to do the dentistry necessary to improve their mouth condition. This just shows that they did not care about the dogs, only their blood. With the information that we have, if the dogs are not imminently released and no further dogs are given to the Animal Medical Center, we will file action with the New York Attorney General against Grateful Greyhounds and the Animal Medical Center and release to both local and national media how this truly respected giant among Veterinarian Hospitals, truly thinks about dogs they imprison for their blood. I suspect some of the dogs that I saw in April 2004 are still there. Over the past 19 years we have taken dogs out of many horrible conditions. We have not had to euthanize a greyhound in over 10 years for other than terminal illness. We have offered to the Animal Medical Center to take all of the dogs in at our facility and we will requite they pay for whatever is necessary to bring them up to our adoption standards. If they choose to send them somewhere else, that's fine. If they choose to euthanize them, we will vilify them. Almost no one in the greyhound adoption community will adopt a greyhound as a blood donor and the few that do, have very precise parameters about how long they will be kept before being adopted. There are only a few places in the United States that have captive greyhounds as blood donors. I have spoken with the Animal Medical Centers' Dr. Jeffrey Klausner and he has told me he will investigate our position and respond in two weeks of our conversation dated June 3, 2008. If by that time we are not assured that this 'colony' is not either gone or imminently leaving, we will begin the process of filing charges. I would hope to hear from you shortly in response to this letter. This firm is counsel to the National Greyhound Adoption Program. I received a copy of Mr. Wolf's email to you of June 6, and it is my understanding that you or AMC will be contacting Mr. Wolf this week regarding the status of the greyhounds being held at AMC. If this is not the case, please have your counsel contact me. All the greyhounds blood donors that AMC has received from Grateful Greyhounds will be returned, within the next several weeks, to Grateful Greyhounds for adoption to homes. I am very pleased to hear that all of the greyhound blood donors that you received from Grateful Greyhounds will be leaving your facility over the next several weeks. My question for you is this: Are there other greyhounds at the AMC that you did not get from Grateful Greyhounds, and if so what is their status? If there are greyhounds that you received through another organization that may not exist for possible return, please advise. We would be willing to take those greyhounds into our facility. I would certainly hope that none of the greyhounds that you have in your possession would be considered for euthanasia and that all will be accounted for. I would appreciate if you could advise us when all of the greyhounds have been removed from your site alive. I think we'll all have a sigh of relief. Thank you for your cooperation. After the dogs from Greatful Greyhounds are returned, we will have 3 greyhounds left. Assuming we can meet our needs for blood and blood products, we will find foster homes for these dogs by the end of the summer. If we cannot id foster homes, I would be happy to send the dogs to your facility. None of the dogs will be euthanized. I am very pleased that the greyhounds you currently have in your possession as blood donors are destined to leave shortly. I have a serious concern based on information that I have received, that Grateful Greyhounds has neither the desire, nor the ability to take in and properly prepare these greyhounds for adoption. I would feel better if one greyhound was going to 19 different groups than so many going to a small group with no kennel and limited financial means. I would hope that this situation can come to a speedy conclusion as opposed to one that is protracted. If you are willing to share photographs and age/ear data on the dogs you currently have we could begin looking for potential adopters. It would be much better if they could be placed in a normal kennel environment that they are used to, going back to their kennel days. Each dog could then be individually evaluated for its needs and found the best placement. These are things that we have been doing for 19 years. We would hope that you will consider this proposal for the good of the dogs. This firm represents NGAP. David Wolf has referred your email correspondence with him to me. In follow up to Mr. Wolf's emails, I am writing to advise you that NGAP is willing to assist Grateful Greyhounds by taking any greyhounds that are released by the Animal Medical Center ('AMC'), and which cannot easily be placed for adoption by Grateful Greyhounds. We have notified counsel to Grateful Greyhounds of this. We noted from your most recent email that three dogs did not come from Grateful Greyhounds, and that you are prepared to release those dogs if AMC can meet its needs for blood and blood products. We have been advised that all blood needs of AMC are able to be fulfilled from outside AMC, and we do not see any reason all the dogs cannot be released for adoption. We would like confirmation that all of the dogs are going to be released, and NGAP is willing to accept these additional dogs for placement in homes by adoption upon their release. We do not understand the concept of 'foster homes' for placement of the dogs, if they are not being adopted permanently. If they were to go into a foster home, how would they ultimately be available for adoption? In follow up to Mr. Wolf's letters to Grateful Greyhounds and you, and your response, I am writing to advise you that NGAP is willing to assist Grateful Greyhounds by taking any greyhounds that are released by the Animal Medical Center ('AMC'), and which cannot easily be placed for adoption by Grateful Greyhounds. Dr. Klausner recently advised Mr. Wolf that AMC intends to release most, if not all, the greyhounds held by AMC. Dr. Klausner indicated that all of the greyhounds received from Grateful Greyhounds (which he indicated was all of the greyhounds at AMC except for three dogs) would be returned to your client. Mr. Wolf is concerned that this release of all of the greyhounds may be difficult to place for adoption, and given the size of NGAP's program, it would be willing to take all or some of these greyhounds, in order to avoid any problems associated with a mass release to one organization. Please let me know how Grateful Greyhounds intends to manage this release of dogs, and if NGAP may be of assistance in taking these dogs and placing them for adoption. My client's primary concern is the health and welfare of the dogs, and we hope this will be handled appropriately. Many of our adopters and others may have known that with great passion we have tried to have all of the greyhound blood donors used at the Animal Medical Center in NYC removed from that facility. After I toured there in 2004, I made it known that the conditions under which these greyhounds were being housed and cared for was not at all to my satisfaction. You might say they blew me off at that time, but they also became very paranoid about the fact that someone on the outside knew what they were doing. Just recently, NGAP, with the help of an unnamed adopter, pulled off a Paul Newman/Robert Redford sting operation. That operation gave us information that showed that the Animal Medical Center did not lawfully have the greyhounds and they were taken there through misrepresentation. In the meantime, working on the sidelines for a considerable period of time, Dr. Guillermo Couto of Ohio State University was trying to arrange to supply the AMC with all of the blood they could potentially need. This quote was taken from an email sent to me by Dr. Jeffrey Klausner, President and CEO of the AMC, 'All the greyhounds blood donors that AMC has received from will be returned, within the next several weeks, to for adoption to homes.' supplied AMC with these dogs through misrepresentation and they have also been scrutinized and put on notice of possible New York State Attorney General action if the dogs were not released on a timely basis. It would appear that these greyhounds will be free and I suspect you will find them listed on website. For any greyhound adopted from the Animal Medical Center's blood donor program, NGAP will perform all of the dental needs necessary free of charge. Simply contact NGAP, give us the information and we will arrange an appointment. And guess what? There are a few other greyhound blood banks out there! Who will be next? Many of you may remeber that I am the one responsible for using greyhounds as blood donors in NYC. I cleared it with the owners and this has been a successful program for years. There stay is not long and they are cared for well. in 2004 David Wolf from NGAP made a stick just to be shot down well now he did it again and we are closing the program. ANY owner who allows their dog to go to NGAP should be ashamed as he is out to end racing. Recently he has been accomopanyed by a group who has received thousands of dollars from people on this list, under the pretense of being pro racing. I cannot mention the name BUT THEY know who they are!!! I will post a copy of the letter i wrote in rebuttal to david Wolfs misguided lies, but I ask you please do not allow your dogs to go to this guy he is dangerous! He is out to get racing and seems to be such a jerk even GPA gives him dogs. I did but i stopped now his gravy train must stop too! For many of you old timers you all know that I have had a relationship with the AMC for many years. Mr. Wolf does not want to put my name here for fear of lawsuit. Which if I have my way he will get anyway. He says that his people pulled off covert operation and found out information on these dogs. He claims the owners knew nothing of their disposition, well folks once again he is on a witch hunt. Any dog I sent to the AMC which were many ( all have been re homed that were suitable as pets)was with full disclosure. The reason Mr Wolf is not privy to the facts he wanted is because it is not any of his darn business. Mr wolf had been searching to start issues many years ago and staged a protest on the AMC. The only protester that showed up was HIM. He came in his own LIMO and walked the streets with a sandwich board talking about how bad the AMC was caring for these dogs. I have his letter here and I will cut to the chase on his stupid unfounded comments. On Wednesday April 14 2004 David Wolf was allowed to tour the facility where the greyhounds were housed.He states he was clearly impressed with the facility. (building) and that president Nixon's daughter was there with her non greyhound waiting to be seen. ' He was given the specifics of the blood donor program. ' Each greyhound receives routine health care annual physical screening blood tests heartworm and flea treatment and a dental cleaning and the greyhounds only donate one unit of blood every 4 weeks.' I was very impressed to this point' stated Mr Wolf. when brought to the greyhound wing it looked like a hospital ward ( gee I wonder WHY)'' The dogs were not permitted to see each other , everything was connected by a narrow aisle way, He was greeted by one of the donor dogs walking around this aisle' , he claims he was told that was their exercise daily. In fact the greyhounds are walked numerous times daily on the roof of the facility as they must be kept away from other animals and the filth on the streets if NYC. See they are donors they must be cared for properly and in a semi sterile fashion. ' A true professional in medicine would see that' Mr Wolf ' The dogs were clearly overweight had long nails and bad teeth' This is where the real David Wolf comes out he attacks the care of their teeth 'periodontal disease with obvious root exposure ' I didn't know Mr Wolf was a DVM or even a Tech for that matter and he is going to judge the care provided by one of the best vet hospitals in the country. He then goes on to evaluate their sleeping arrangements' 8' off the floor and 30' wide x 36' long is a canvas bed. ' In my opinion says Mr Wolf they were too small and too uncomfortable. ' The water bowls are too big they are round not flat sided the food dishes were too big '. ( im trying not to laugh here)' He asked the staff why they could not have fleece or some other type of bed he was told they tear them up ' Mr Wolf says' His dogs sleep on carpet.' Well that is most unsterile and filthy as even the state of CT would not let me use carpet in the pet kennel I could use in the racing kennel but not where people of unknown origin came from as carpet hold disease if not properly cleaned trust me many days of back breaking washing carpets have been done in my 15 years. Mr Wolf' feels that the AMC fails miserably in the care of the greyhounds in their care' ' he states that he was told that some dogs come with broken legs in need of repair, and if the AMC didn't take them they would be euthanized' NOT A FACT: The AMC has graciously helped many broken dogs as well as sick and injured and NOT ONE ever stayed as blood donor I HAVE THE PROOF!!!! Mr Wolf also states' each dog must be tick tittered prior to being accepted into the AMC donor program' Every one of the dogs I ever gave to the AMC was cleared for donorship however what he fails to tell you is that we tested hundreds of dogs at their expense, those that tested positive were treated prior to adoption. Many groups cannot afford to test these dogs prior to placement i'm not even sure that NGAP does. In his letter Mr Wolf ' Its a business to them and defines what should be done for these dogs' Again he goes back to the teeth and the costs blah blah blah. When I went to the AMC on one of the many occasions, I, found these dogs happy healthy yes fat but they are alive. My personal feeling is their is nothing wrong with the donor program at the AMC however now that has come to an end because a meddling uneducated fool stuck his nose in where it didn't belong. Its a shame NGAP doesn't take dogs with issues trust me Mr. Wolf told me that himself when i was looking for help placing dogs. The only thing this media monger wants is attention and money. Please tell me why he needs that facility he just built. HE ISNT even supposed to get dogs he is persona non grata with the industry. All of his dogs must come to his facility for dental cleaning and he does a bang up retail business. WHY does he need to stick his nose in here, why not spend this time and energy finding homes for greyhounds. He fails miserably to explain why many of these dogs are there and quite honestly many should have been euthanized as they were serious behavioral issues or down right threats to the public. See responsible people in the adoption community understand not every dog is adoptable some need more time some need a needle yes its true!!!. The AMC took dogs with issues and I'm glad to say most were rehabilitated and are now in loving adoptive homes. NO THANKS TO HIM!! I have been beat up and chastised for many years for my relationship with the AMC and using dogs for donors, well folks I STILL believe its a good program but since MR wolf doesn't everyone has to kowtow to him NOT me. Maybe now he will now be watched very closely and investigated he wants to play covert games no problem. I know he has so many fans on this list don't bother flaming me its so been done before and it doesn't matter to me. Words don't hurt me. My job is placing greyhounds and I DONT MAKE a salary nor does PWP have millions in the bank but we are darn proud of what we do. WE don't pretend to be against racing as one groups recently saddle up with Mr. Wolf was given thousands by the industry just to secretly be working with him YEAH I KNOW and trust me it will be exposed in due time. The name of the game is to find loving caring homes for greyhounds upon their retirement not exploit them or use them as money makers or to grab media attention for personal gain. which is clearly done by NGAP. Why does Mr. Wolf show up at vet conferences he isn't a vet to my knowledge heck he was asked to leave one many years ago. Why does he taunt the industry when he makes a profit of the dogs just like racin g owners do ? Why did he need that big facility racing kennels don't have that and adoption groups don't have that? ASK me its the old adage ' Look at what I, have' Mr Wolf the one who dies with the most toys wins doesn't work for me' I run my pitiful little program out of fosters and my own living room while U sit in your mansion and have your million dollar kennel and you cant put a PIMPLE on my progress. You are just a meddling fool in my opinion who should find much better things to do with your time and money. YOU have no clue about the true meaning of greyhound adoption/rescue whatever you choose to call it. ' you are in business': you make money you pay help you have all the newest toys and yet dogs are still in need of adoption and your million dollar kennel is worth nothing nor are your toys for a greyhound in need of a home. Your little secret cover missions don't impress me much, first and foremost I have nothing to hide never have never will. I hope one of your dogs never need blood transfusions or one of the ones you have adopted out and goes to the AMC for help. They will not get a true greyhounds blood you think its ok to buy blood doesn't surprise me. Its all about money Personally if my beloved pets needed blood I would hope for a greyhound donor, not you shame! My own dog was a donor and he saved many dogs and he was proud so was I it was beautiful to see another dog alive because of my boy. Not you if it was up to you that dog would have cost the owners thousands which they could not afford to spend and the dog would be dead all the same. Vicious cycle. I'm personally appalled at your actions as they resulted in a very good program going in the toilet. But it doesn't surprise me as now you can beat your chest and say ' I stopped the AMC blood donor program' great accomplishment you should be proud (NOT) don't worry your fans will support you no matter what you do you are their god scary to say the least but hey that's my opinion. Like I said don't bother to flame me doesn't work I have real strong skin and even stronger convictions on greyhound adoption NGAP is not an adoption group its is a resale outlet of used greyhounds. You know it I know it now so will everyone else! Guidestar is public people can see just how much $$ you have and just what you pay for. Any racing greyhound owner that lets a dog go through your program should be ashamed, as you are out to end greyhound racing what will you do then MR WOLF. retire and live off the money you made from the greyhounds, gee to bad those racing owners cant do that! NOW for your listening enjoyment THIS IS MY OPIONION and does not reflect the opinion of anyone affiliated with PWP, AMC nor its board of directors , Nor PWP board of directors. ITS SOLELY MY opinion. My statements are clearly my own. Just like my dogs If I want them to donate blood they will and you CANNOT nor will not stop me! OH and on another note you will never see any of these dogs for dental work even if its free, you don't deserve to touch these dogs as far as your concerned you would rather have seen them and all the dogs they have helped DEAD. Oh and also no one misrepresented themselves or lied about where the dogs are or were going as I spoke to the owners myself and each one knew so you are as always full of baloney. No one with the show I have to go to work to pay for my hobby of placing greyhounds into loving homes see we make no profit and have no big donors to help so off we go. Don't bother to flame me i wont even read it. This matter is not open for discussion with me. OH and one more thing all those poor greyhound we took out of the AMC will go to foster homes or permanent homes if it were up to me they would still be operating this program but once again the honest people suffer as well as the greyhounds. And those of you who like to cross post stuff don't worry I ran this by attorney its legal and also I will post it myself. I am writing in response to your e-mail to me of June 25, 2008. We will not be accepting the proposal outlined in your e-mail. 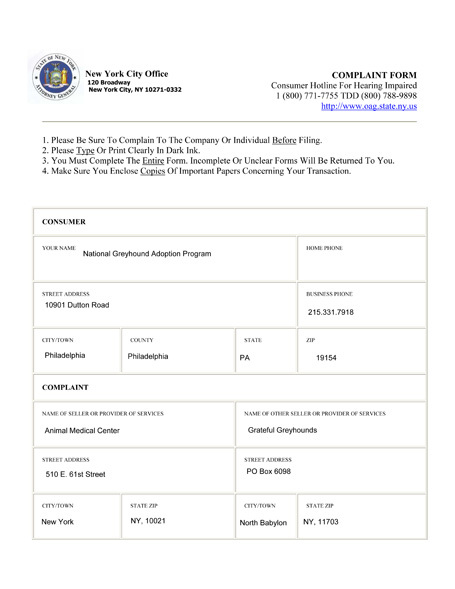 As stated in earlier correspondence with you, The Animal Medical Center is handling the issues relating to greyhounds in our possession in an appropriate manner. We expect that all groups from which we have received greyhounds will act in accordance with the best interests of the greyhounds, with due regard for their safety and care. I wish the National Greyhound Adoption Program all the best. It has been several weeks since we last communicated. I would appreciate it if you could give me an update on when the remaining blood donor greyhounds will be leaving. I responded by letter dated June 30, 2008 to you inquiries, and advised you that AMC is appropriately handling these matters. Therefore, I will not be responding further. I received your recent letter. I recognize that a large organization, such as the AMC, may have difficulty in responding to concerns of a small program such as ours, but I had hoped to receive a more appropriate and cooperative response from you regarding the release of the three greyhounds that remain at your facility. As you know, NGAP strongly believes that the three remaining greyhounds should be placed in the care of families desiring to adopt them, or an institutional program, like NGAP, that can provide high quality care for these dogs until such time as they may be able to be adopted. This is important enough to us that we will pursue all lawful and appropriate avenues to get these dogs released, including publicizing their plight should that become necessary. I think it would be in everyone's interest to avoid such a dispute becoming a public confrontation, and I have attempted to stay in contact with you for the purpose of handling this in an amicable manner. Your recent letter suggests that you are not willing to try to resolve this matter amicably, and our organization is prepared to take action to protect the interest of the greyhounds that remain in AMC custody. Based on information collected by NGAP, the Animal Medical Center, for many years, used animals through misrepresentation. The proper way to remedy this is for AMC to release all of those animals, and not to exploit animals in the same way again. Since we were very concerned about the 15 greyhounds returned to Grateful Greyhounds, we wished to receive some disposition from Leif Rubenstein, their attorney. I called him on the phone seeking information and after a short conversation, he hung up on me. We subsequently sent the following letter. Have the greyhounds been adopted, are they in foster care or have they been euthanized? If you cannot supply me with an answer to these questions I will obviously have to take some legal action through the State of New York to get that information. We appreciate your civil cooperation in this matter. I got a call today from Lisa Cleary, the lawyer for AMC. She was very level-headed, and appeared genuinely interested in trying to resolve open issues between AMC, Klausner and NGAP. We spoke for about twenty minutes, and I tried to impress upon her the strong level of interest we had in making sure the dogs were properly placed, and being treated well, and our suspicion about Grateful Greyhounds not placing the dogs for adoption. I also reopened our inquiry regarding the 3 dogs remaining at AMC. She expressed concern regarding the website treatment of Klausner and AMC. She asked if those pages could be temporarily brought down during our discussions, with the hope that this would be viewed as a sign of good faith, and would assist in leading to an amicable resolution of the issues between AMC and NGAP. I told her that you thought you had clearly been given the brush off by Klausner, and that this did little to generate good faith and trust, but that I would ask you to temporarily remove the pages, and that I would suggest putting up a notice that NGAP is currently in discussions with AMC to attempt to resolve any issues between NGAP and AMC, and that we are removing the pages relating to the dispute during this time, in the hope that this will aid in reaching a quick and beneficial result, and one that will be for the benefit of the dogs that had been held by AMC. She agreed that this would help her in her attempt to bring about a resolution. I think it is worth doing, and she promised me she would be back to me by mid-week next week. Many have followed our dispute with the AMC regarding their use of greyhounds as blood donors. Our attorney has recently spoken with their attorney and as a gesture of good faith to attempt to resolve the issues that we have with Animal Medical Center, information regarding this subject will be temporarily removed from our site. We waited a week and a half to receive some response from the AMC, and although both attornies exchanged voice mails, nothing happened to relieve our concerns in regards to the three remaining greyhounds and the fifteen greyhounds previously released to Grateful Greyhounds. Subsequently, all information was restored on October 1, 2008. Below is a picture of the letter we sent via certified mail to Leif I. Rubenstein, Attorney for Grateful Greyhounds dated September 16, 2008. You will see that it was returned to us marked 'Refused'. Effective this date, there are no greyhound blood donors at the Animal Medical Center. We won! The AMC had promised us that they would be getting their greyhound blood donors out of their facility over the next several weeks. We did not know when that would be, but through a local contact we learned that fifteen had left, presumably being returned to Grateful Greyhounds where they originated. We also then learned that there were three greyhounds left, termed 'lifers' because of their aggressive behavior, and although the AMC told us that all of the dogs were gone, the lifers were still there. We continued to pressure them from our office. We also had our attorney, Steve Foxman, pressure their attorney. Elaine Sloan, a former volunteer greyhound walker at the AMC, was informed that Dr. Klausner was looking for someplace to send the dogs - clearly someplace other than NGAP, since we had offered to take the remaining dogs several times. The name Grey2K was mentioned and after several weeks the AMC was ready to release all three greyhounds to Grey2K in Massachusetts, certainly far enough away from NGAP. Grey2K dispatched a volunteer to drive to New York City on the weekend of Dewey, Delaware's 'Reach the Beach' event. That vehicle rendezvoused with our NGAP volunteer, John Bevill. We loaded the Grey2K vehicle with the cages needed to pick up the dogs. Our Massachusetts volunteer arrived at the AMC with a vehicle with Massachusetts plates, a Massachusetts driver's license and a Massachusetts accent. The pickup of the greyhounds was uneventful. Our two volunteers rendezvoused again and our precious cargo was swapped. As evening approached, the three 'lifers' were released into the long runs at NGAP. They ran for a long, long time. They have now settled into our kennel quite nicely and, as of the date of this writing, one has already been adopted! We thought we were finished. We thought that we had gotten them all out. We made a champagne toast at dinner that night in Dewey. But two months later the AMC called Grey2K once again to see if they would take one more greyhound. Of course, the answer was yes! There was another rendezvous planned and executed and on December 6, 2008, Spuds was able to take his long run in the sand at NGAP. We cannot be sure, but we believe that Spud may have had teeth that were so bad some extractions were necessary. Obviously, if he was released with bad teeth, the AMC would not have looked particularly good. If he had been released right after the extractions, it would have been obvious that he had been there a long time without the much-needed extractions so the healing time was necessary before his release. It seems as though someone was trying to cover up that it had happened at all. Dear Mr. Spuds is supposed to have been aggressive in a previous home. He seems to show no signs of that thus far. We still have no absolute confirmation that the fifteen dogs that were returned to Grateful Greyhounds were actually adopted or put into foster care. For us to believe that this has happened, we would have to actually contact the new adopters to see if this was truly the case. I'm afraid we cannot rely on the word of Grateful Greyhounds or the Animal Medical Center. Our present intentions are to file a legal action against the Animal Medical Center in the near future. I am filing this complaint as the Director and Manager of National Greyhound Adoption Program. Through independent research, NGAP discovered that greyhounds, left by their owners with Grateful Greyhounds, specifically to be adopted into homes as pets, were instead placed with the Animal Medical Center for use as blood donors. These greyhounds were used as blood donors without the express consent of their respective owners. The Animal Medical Center benefited from this misrepresentation and failed to contact the owners for permission to use the dogs as blood donors. Attached hereto are affidavits from greyhound owners which state that they specifically requested that their greyhound be placed in a private home only, had no knowledge that their greyhound would be used as a blood donor and did not give permission for their greyhound to be transferred to the Animal Medical Center or any other blood bank for use as a donor. In addition we feel these greyhounds were not provided with adequate socialization and exercise programs as is appropriate for former racing greyhounds. The Animal Medical Center stated to us that fifteen of the dogs previously held there as blood donors were returned to Grateful Greyhounds. To date, they have given us no evidence to support that claim. We are concerned about the whereabouts and safety of these fifteen dogs. The Animal Medical Center is located at 510 East 61st Street, New York, NY 10021. The phone number and email address are as follows: (212) 838-8100 Phone, webmaster@amcny.org. Grateful Greyhounds is located at PO BOX 6098, N. Babylon, NY 11703. The phone number and email address are as follows: (516) 735-5070 Phone, greyhoundsavior@optonline.net. The Animal Medical Center has told us that fifteen of the dogs previously held there as blood donors were returned to Grateful Greyhounds. To date, they have given us no evidence to support that claim. We are concerned about the whereabouts and safety of the fifteen dogs. The Animal Medical Center had also originally told us that these fifteen blood donor dogs were the only ones in their program, when in fact, additional greyhounds were used. Three additional dogs were later released and then another dog long after we had been told that all were gone. After researching these dogs, we found that none of the owners had given permission for them to be used as blood donors. I have carefully reviewed your complaint. Unfortunately, your problem is not one for which our office can offer assistance. You may wish to contact the Better Business Bureau, which offers a mediation service to businesses. The BBB's New York City address is 257 Park Avenue South, New York, New York 10010. For a flat fee of $5.00 you may also call the BBB at (212) 533-6200 and charge the call to your credit card. Their website address is http://www.newyork.bbb.org . If you have not already done so, you should consider consulting your own attorney for advice on your options. This is in response to your letter dated July 17, 2009. I disagree with your interpretation of the problem regarding the Animal Medical Center. The problem itself exists due to misrepresentation. Greyhounds were placed into the facility without the express permission of the owners of those greyhounds. Misrepresentation is against the law and correction of that misrepresentation should be completely documented. The Animal Medical Center has failed to provide that documentation. From personal experience, we know that they have misrepresented information given to us. 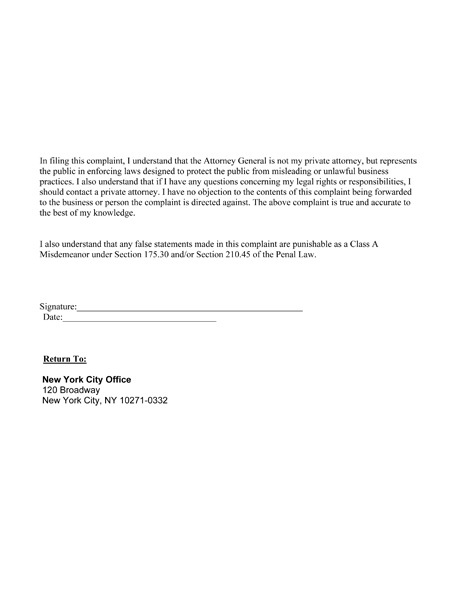 We ask that your State Attorney General elicit a response from them. I would be happy to speak with you on the subject if need be.